It’s complicated. I find myself using that phrase a lot these days, pretty much every time a friend from back home asks me my opinion on any of the big issues at play in Honduras. Were the elections clean? It’s complicated. Which party would best serve Honduras? 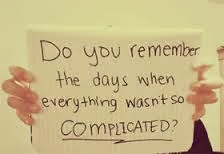 Complicated. Is it true narco-traficantes are calling all the shots? Well, that’s…complicated. Is the country being ruined by drug trafficking? Sorry, that one’s complicated, too. You get the picture. I thought I saw the world in shades of grey already, but it took Honduras to introduce me to just how many shades there really are. Even things that I once thought I had nailed in terms of how I felt about them – poverty, child labour, murder, violence – I now find myself rethinking. A friend sent me an article this week that talked about the vast majority of Hondurans living in “abject poverty." It struck me that while it’s true that millions of people here lack worldly goods, secure incomes and money, it’s simplistic and even insulting to portray their lives as one of abject poverty. I don’t know how they manage with so few resources, but they do. There is much to be admired in people who can take a small plot of land and feed themselves and their families, and who keep moving forward despite being constantly beset by new problems. While I’ll certainly never use the phrase “poor but happy” again or romanticize a simple life off the grid, we’re not doing Hondurans any favours by painting everybody here as helpless victims living desperate lives. That’s not to suggest we should quit paying attention to poverty reduction, or that developed countries should get a free ride on policies and practices that create and support poverty in the countries where they have commercial interests. But slapping an “abject poverty” label on the country really does a disservice to the resilient, resourceful people who have figured out how to live on scant and irregular incomes of $150 or less a month. As for murder, that’s a black-and-white issue until you live in a country where there’s no functional justice system. Murder is never a good way to settle scores, of course, but it does become more understandable when you think about families and towns left on their own to manage the crimes committed against them. If somebody killed one of your loved ones, for instance, what would you do if there was almost no chance that the killer would ever be arrested, tried and jailed, even in cases where everyone in town knew who did it? What might a group of subsistence farmers be capable of one night when they finally caught the thief who had been ruining their lives by stealing their cows and commercial crops? In Canada, our police and courts take such awful decisions out of our hands and permit us to believe that “justice will prevail," with no need to take the law into our own hands. Sure, we complain about court decisions, but in general our justice system serves us quite well. As for whether narco-traficantes are the bad guys here, I’d have to say… it’s complicated. Yes, I suspect the cocaine distribution business (Honduras is essentially the FedEx of the industry) is responsible for much of the staggering murder rate in Honduras, although there are no official numbers. Yes, the business in all likelihood has tremendous influence in the country - as does any lucrative, job-creating industry anywhere in the world – and is well-integrated into every level of government and public service. But looking at the issue from a purely economic viewpoint, this country would be sunk without narcos. However you feel about the product they’re moving, they create a lot of jobs. They've got money - to eat at restaurants, stay at hotels, shop at the malls, buy medical services and new vehicles, build nice houses. They've got money for all the things that stimulate more economic activity, which is the only thing that ever truly pulls a country out of poverty. They like real estate, and at least in Copan Ruinas are said to be responsible for much of the new construction in town. They apparently love owning dairy cattle and are among the few farmers who can actually afford good care for their cows, assuring a better supply of Honduran-produced milk and beef. They are clearly intelligent people who know how to run a business, because even while the country staggers from one crisis to the next, the cocaine keeps flowing north. Not enough narcos understand that they could really improve their image by funding more good works in their communities, but I've heard quite a few stories of generous narcos building a new school, paving a road, coming to the rescue of villagers in financial jams. Yes, they lack a sense of proportion in settling scores and really need to get a grip on the violence in their industry, but characterizing them as hateful villains to be eradicated is gross oversimplification. So. That’s my new world view – shades of grey as far as the eye can see. Sometimes I long for the days when I was more certain, and question whether I’ll be certain about anything at all by the time I die if this keeps up. But I guess that’s what happens when what you used to “know” collides with what you now know first-hand. It’s complicated. Shades 9f grey indeed, my dear friend, even back here. But I think I prefer our 'system' to theirs. I feel for the people who live there. Anyway, I thought I would drop by here since my old laptop gave up the ghost and I am awaiting stuff being installed in the new one I grudgingly bought. So, right now I am on Wendy's and don't really understand all its irritating quirks. So I cannot believe your sojourn has nearly come to an end. Time passes so quickly, which frankly scares the crap out of me. Anyhow, some way or another I'd love to see you when you get home. So very true Jody, as anyone who has spent any time in a developing country knows. Also true for those who live on the margins of our wealthy society. I think you are being a tad generous in crediting the Narco Sector with too very much positive economic impact here in Honduras. One the reasons Honduras *is* sinking is because of Narco Cash. Narco Cash Ncreated inlation has forced agricultural land out of the reach of the subsistence/small family would be farmers. Narco Cash has made the "work hard and get an education" paradigm an object of derision among many poor young men, particularly in the area where Narco operations are part of day to day life. Every town and village in La Miskia has a crack scene. Many fisherman who opted not to work with the Narco FedEx have been forced out of fishing out of fear of finding themselves in a wrong place/wrong time scenario like the six civilians machine gunned in a counter-drug operation in Auaus. I have been spending 2 or 3 months a year for the last 10+ years sport fishing for tarpon and snook. I can't do that any more with Helicopter gunships cruising the rivers looking for targets and sometimes not all that careful about target selection.